Team AuDis, consisting of three undergraduate students of the Dept. of School of Electronics and Computer Engineering, won first place in the Capstone Design Award of the University Industry Cooperation (UIC) EXPO 2018 held in Busan from November 7 to 9. 417 universities and organizations all over the country participated in the EXPO, and 21 teams received awards in the design award section. 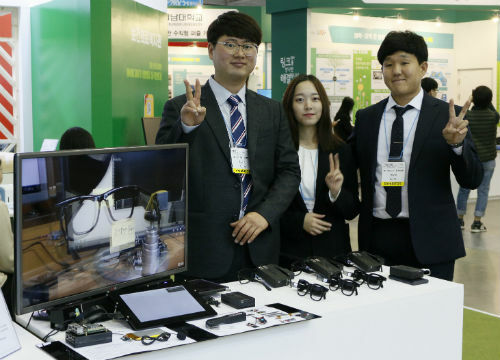 The team members, Kim Sung-hoon, Moon Su-min and Kim Gyu-ree submitted sound-visualization glasses for hearing-impaired people at the design competition. They developed the glasses by utilizing AI ‘Deep Learning’ that they learned at Capstone Design classes. Kim Sung-hoon (Senior, School of Electronics and Computer Engineering) said, “I think we can help many hearing-impaired people through visualizing 8000 sound sources that we can hear in our lives.” With the goal of industrial-academic cooperation growth, the UIC EXPO has been a place of sharing knowledge and techniques since 2008.